Why Choose To Refinish Your Hardwood Floors? Hardwood floors are a healthier alternative to carpet. Hardwood does not trap or harbor dust, or dust mites like most floor coverings, which means better air quality. Hardwood is especially good for people suffering from allergies. Hardwood floors greatly reduce the accumulation of toxins on floors. Hardwood floors are durable and desirable. Hardwood floors last beyond a lifetime. They are one of the most desirable floor coverings and are a great way to increase the resale value of your home. Considering the durability of hardwood flooring, you are saving money when you choose hardwood. Hardwood floors are ecologically sound. Unlike most floor coverings, hardwood floors come from a natural resource that is sustainable. Most timber today comes from forests that are carefully managed to ensure continued resources in the future. Almost twice as much hardwood timber is added every year through new growth as harvested. Routine maintenance consists of sweeping, vacuuming, and occasionally cleaning with a damp mop. Protect your floors with rugs and felt pads to keep your finish free of scratches. 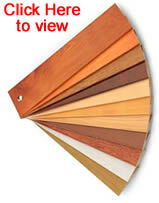 Hardwood floors can be refinished in a wide variety of colors. With the multitude of stains and finishes, your choices are endless. These choices can complement and enhance any style of home.